MT Series transcoders are designed for bi-directional remote control applications. Eight status lines can be set up in any combination of inputs and outputs for the transfer of button or contact states. An automatic acknowledgement indicates that the transmission was successfully received. The large, twenty-four bit address size makes transmissions highly unique, minimizing the possibility of conflict between multiple devices. A Serial Interface Engine (SIE) allows configuration and control of the transcoder by an external microprocessor or PC. When activated, the transcoder encodes the current input states and its address into a packet and outputs a digital data stream. This data can be sent to a receiving unit by RF modules, infrared link or even a wire. The receiving unit checks the received packet to make sure there are no errors and that the received address has been learned. If everything is good, then the transcoder replicates the received input states on its outputs. These outputs are connected to whatever circuitry is required by the application. The receiving unit then sends an acknowledgement to indicate that the command was successfully received. The transcoder is configured through hardware lines or through a 1-wire serial interface. The hardware configuration allows for low cost simple bi-directional controls while the serial interface allows for more advanced functionality on higher end products. 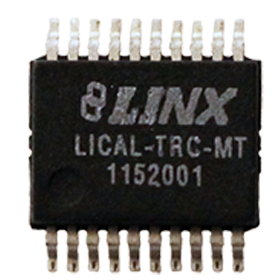 These features include programming the local address, the learned address list, enabling acknowledgements, targeted transmissions, latched or momentary outputs, and initiating transmissions and monitoring reception on one line instead of using 8 hardware lines. The MT Series transcoder also outputs the ID of the originating transcoder for logging or identification. The transcoder can be configured to allow only certain transcoders to activate certain outputs. This allows the creation of user groups and relationships rather than an all-or nothing activation. Housed in a tiny 20-pin SSOP package, MT Series parts feature low supply voltage, current consumption, and selectable baud rates. The MT Series transcoder does not use encryption or rolling code, so it does not protect against intentional security threats. For high security applications, consider the HS Series.